Metoclopramide is a prescription medication used to treat nausea, vomiting, and reflux disease in dogs and cats.Metoclopramide is also used to treat post-operative nausea and vomiting and to prevent nausea and vomiting associated with cancer chemotherapy. What is Metoclopramide used for? Metoclopramide tablets 10mg are used to treat and prevent nausea and vomiting that can be caused by a variety of conditions including, gastrointestinal disorders, intolerance to anti-cancer drugs used for chemotherapy, deep X-ray or cobalt therapy used to treat internal tumours and congestive heart failure; also to prevent post-surgical nausea and vomiting often caused by surgical anaesthetic, to relieve nausea associated with migraine headache and to help with diagnostic procedures that may cause nausea, such as duodenal intubation (passing tubes into the intestine). Metoclopramide tablets 10mg are also used to relieve symptoms of digestive problems like bloating, fullness, heartburn, regurgitation of bile, abdominal pain and flatulence, which can happen when the digestive system is out of rhythm, or associated with conditions like peptic ulcer, inflammation of the stomach (gastritis) or intestines (duodenitis), hiatus hernia, dyspepsia (indigestion) after cholecystectomy (gall bladder removal) and cholelithiasis (gall stones). Metoclopramide tablets 10mg are also used to treat conditions where gastrointestinal motility is disturbed, to increase intestinal movement and relieve gastric stasis, which can occur after surgery. This action of Metoclopramide tablets 10mg also helps with diagnostic gastrointestinal radiology that depends on the movement of barium through the intestines. The same mechanism of action enables Metoclopramide tablets 10mg to provide the various clinical benefits that it is used for in a variety of conditions. Metoclopramide tablets 10mg contain metoclopramide, a dopamine antagonist that acts as an antiemetic (prevents nausea and vomiting) and as a gastrokinetic (stimulates gastrointestinal mobility). Nausea and vomiting are triggered when the chemoreceptor trigger zone (CTZ) in the brain is stimulated and this causes nerve impulses to be sent to area postrema or vomiting centre of the brain, to induce the vomiting reflex. The CTZ can be activated by two mechanisms; either indirectly by transmission of nerve impulses sent to the brain from the stomach when it has been irritated, or directly by chemicals or drugs that are circulating in the blood and stimulate receptors in the brain. Metoclopramide in Metoclopramide tablets 10mg binds to dopamine receptors in the CTZ, which blocks both direct and indirect stimulation of the vomiting reflex. Metoclopramide in Metoclopramide tablets10mg also interacts with parasympathetic nervous control of the upper gastrointestinal tract, in which the vagus nerve controls normal stomach emptying and movement of digested food into the upper intestine by peristalsis (waves of contraction). A malfunction in this control mechanism can cause several gastrointestinal disorders. Metoclopramide in Metoclopramide tablets 10mg binds to the dopamine receptor, which increases levels of the chemical acetylcholine thereby increasing contraction of the stomach muscles so that food can pass more easily through the stomach. This also allows the pyloric sphincter at the junction of the stomach and the small intestine to relax, so that food can pass into the intestines, increasing peristalsis in the intestines. These combined effects of metoclopramide in Metoclopramide tablets 10mg help restores the natural rhythm of muscle contraction and relaxation in the stomach, which helps push food through the digestive system to relieve uncomfortable symptoms of dysmobility (when food processing slows down) and prevents vomiting. Metoclopramide tablets10mg contain the active ingredient metoclopramide, a dopamine antagonist that is used as an antiemetic (prevents nausea and vomiting) and as a gastrokinetic (stimulates gastrointestinal mobility. They also contain pregelatinised maize starch, microcrystalline cellulose, maize starch, colloidal anhydrous silica, stearic acid, hypromellose, macrogol 6000, titanium dioxide and purified talc. Metoclopramide tablets 10mg contain metoclopramide, a dopamine antagonist that is used as antiemetic (prevents nausea and vomiting) to treat nausea and vomiting caused by a variety of conditions, including, gastrointestinal disorders, anti-cancer drugs used for chemotherapy, deep X-ray or cobalt therapy used to treat internal tumours and congestive heart failure. Metoclopramide tablets 10mg are also used to prevent post-surgical nausea and vomiting, to relieve nausea associated with migraine headache and to help with diagnostic procedures that may cause nausea, such as duodenal intubation (passing tubes into the intestine). Nausea and vomiting are triggered when the chemoreceptor trigger zone (CTZ) in the brain is stimulated and this causes nerve impulses to be sent to area postrema or vomiting centre of the brain to induce the vomiting reflex. The CTZ can be activated by two mechanisms; either indirectly by transmission of nerve impulses sent to the brain from the stomach when it has been irritated, or directly by chemicals or drugs that are circulating in the blood and stimulate receptors in the brain. Metoclopramide in Metoclopramide tablets 10mg binds to dopamine receptors in the CTZ, which blocks both direct and indirect stimulation of the vomiting reflex, relieving symptoms of nauseas and vomiting. Metoclopramide tablets 10mg contain metoclopramide, a dopamine antagonist that is used as a gastrokinetic drug (stimulates gastrointestinal mobility) in conditions where gastrointestinal motility is disturbed, to increase intestinal movement and relieve gastric stasis. Symptoms of digestive problems include bloating, fullness, heartburn, regurgitation of bile, abdominal pain and flatulence, which can happen when the digestive system is out of rhythm, or associated with conditions like peptic ulcer, inflammation of the stomach (gastritis) or intestines (duodenitis), hiatus hernia, dyspepsia (indigestion) after cholecystectomy (gall bladder removal), cholelithiasis (gall stones) and after surgery. Metoclopramide in Metoclopramide tablets10mg binds to dopamine receptors in the upper gastrointestinal tract, which increases levels of the acetylcholine, a chemical that interacts with the nerves that control normal stomach emptying and movement of digested food into the upper intestine by peristalsis (waves of contraction). This action of metoclopramide in Metoclopramide tablets 10mg increases contraction of the stomach muscles so that food can pass more easily through the stomach, as well as relaxing the pyloric sphincter at the junction of the stomach and the small intestine, so that food can pass into the intestines and increasing peristalsis in the intestines. These effects help restores the natural rhythm of muscle contraction and relaxation in the stomach, which helps push food through the digestive system to relieve uncomfortable symptoms of dysmobility (when food processing slows down). What are the side effects of Metoclopramide? The most commonly reported side effects when taking Metoclopramide tablets 10mg include, restlessness, drowsiness, tiredness, fatigue, insomnia, headache, dizziness, nausea, gastrointestinal disturbances, galactorrhoea (milk secretion not due to breast-feeding) and gynaecomastia (breast enlargement). Less common but more unpleasant side effects include extra-pyramidal reactions like convulsion and involuntary muscle spasm. When should Metoclopramide not be used? What medications interact with Metoclopramide? How should Metoclopramide be taken? You should take your Metoclopramide tablets 10mg with a glass of water 3 times daily. The dose you take depends of your age, body weight and the condition you are being treated for. You should continue to take your tablets10mg for as long as recommended by your doctor. How long should you take Metoclopramide? 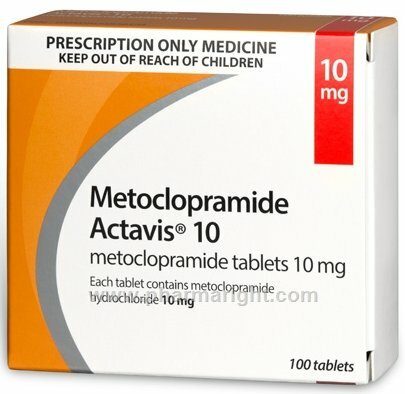 You should continue to take your Metoclopramide tablets 10mg for as long as recommended by your doctor. If you miss a dose of Metoclopramide tablets 10mg take it as soon as you remember, unless it is time to take the next dose, then skip the missed dose. Do not take a double dose. How should Metoclopramide be stored? You should store your Metoclopramide tablets 10mg below 25°C in a cool dry place.